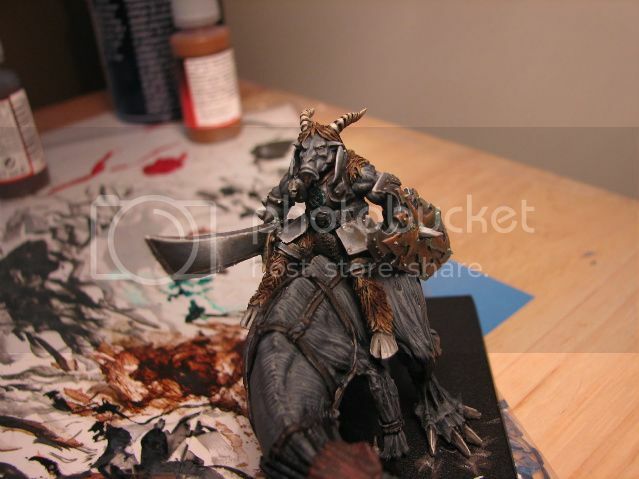 Hey mate if you dont mind me asking i really like your army and was wondering, if you wouldnt mind sharing the recipe for the skin and fur, much appreciated. SS Camo Black Brown mixed through GW scorched brown and GW bestial brown. Sometimes I will add a touch of Buff or Ivory and wash with Vallejo smoke or sometimes a GW wash.
NMM Steel - Luftwaffen Blue Grey built up with Basalt grey, touches of german grey and matte alluminium. You will notice that the majority of the colours are used throughout the model - never in just one place - this helps to create harmony and unity in the model - looks much more natural this way - on the other hand it also means more difficult mixing and aesthetic judgements in order to keep each part looking like a separate identifiable materials.